Start off the Jewish New Year with a celebration of old-country spirit and soul music! 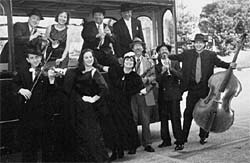 The Maxwell Street Klezmer Band, founded in 1983, has also recorded four CDs, including "You Should Be So Lucky!" and "Old Roots, New World" on the Shanachie label. A local Chicago favorite, the band has also performed at Carnegie Hall in New York; and toured Europe seven times, including a concert at The Barbican Centre in London.